We can’t remember an entire book, or even its outline. We remember a sentence or concept that is highly relevant and impacts how we live. The rest of the book gives context to that sentence. This series highlights sentences from my reading in evangelical Christian counseling that stood out to me and reflections on why these sentences have been so sticky. If you are interested in a well-reasoned argument for Option #3 that tries to accommodate the most helpful elements of the other two options, I would recommend Dunnington’s book. But that is not the subject of this post. Dunnington’s observation is that because we won’t tell people what the defining marks of a good life are, addiction flourishes. He does not claim that this is the only factor that leads to addiction; for that matter, neither do I. 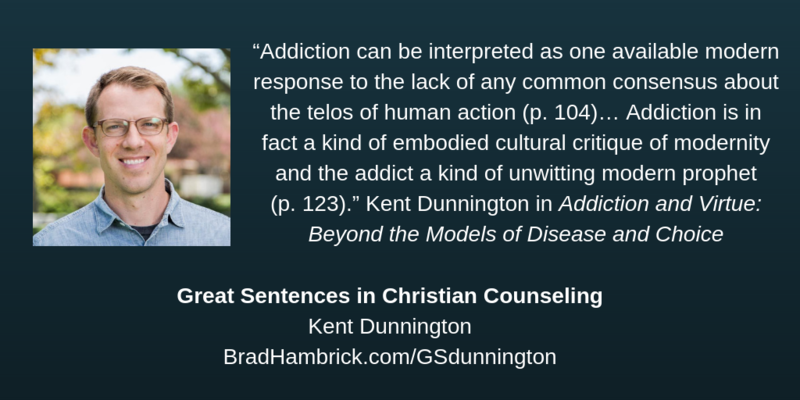 But we should ask, “How does he connect lack of purpose (telos, as a philosopher like Dunnington would say) to an increase in addiction?” He is not merely making the simple argument that bored people often find destructive ways to entertain themselves. Dunnington is making a more substantive argument that cuts deeper into our cultural values. He is saying that the cultural belief (commonly perceived as virtue) that says, “You have to decide for yourself what is worth living for,” does at least two things that increases the likelihood of addiction: (a) more intuitive, it convinces people that what they find pleasurable is inherently good, and (b) it overwhelms people during a season of life – late adolescents and early adulthood – when most are ill-equipped to answer such an enormous question. The first point is the common argument against moral relativism. It merely moves the assessment one step sooner in the decision making process; from choice to values that guide the choice. The second point is what caught my attention and has stuck with me as a “sticky sentence.” Dunnington is saying when we won’t give people a list of core virtues that make for a good life, we overwhelm them with possibilities and they are more prone to escape because they can’t handle being God (defining good and bad for themselves; not just on day-to-day choices, but about the trajectory of their life). My parallel to Dunnington’s argument would be that when we (culture or church) do not define the basic parameters of a good life, we are in effect asking people to solve an elaborate puzzle consisting of thousands of pieces (all their choices of consequence) without giving them the puzzle box top with the picture being created. My experience (anecdotal as it may be) seems to confirm this. The more we culturally believe in relativism the more stressful basic life choices become. I would argue that this is a contributing factor to why adulting classes are becoming more popular. Being an adult requires a definition of maturity. A definition of maturity requires an understanding of what life is about. It is by the grace of God that we are given a purpose to live: to love God and love others (Matt. 22:18-20) by expressing virtues such as the fruit of the Spirit (Gal. 5:22-23) as exemplified by the life of Jesus (Phil. 2:5-11). Can these things be legalistically applied? Yes. But their absence results in an equal-yet-opposite slavery: addiction. This is what Dunnington means when he says that an addiction is “a kind of unwitting modern prophet.” Addiction is telling us something about the times in which we live.